In 2010, at just about this time I was conducting a poll of Maine’s gubernatorial race at Thomas College with the help of about 40 political science students. We all learned a lot. What many of the students learned was that they never wanted to have a career that involved cold-calling people at home. What I learned, meanwhile, was a little bit more exciting and immediately consequential. I learned that Eliot Cutler had pulled even with Paul LePage. We were among the last of the polls in the field that year and maybe it was my students’ persuasiveness, or maybe it was just luck of the draw, but our results ended up spotting the Cutler surge more effectively than any other poll. Though my media skills were yet insufficiently developed to get this out into the local news, I immediately called my Democratic friends and family and told them to vote for Cutler. If they wanted to support an alternative to Paul LePage, I told them that the mass of non-LePage supporting voters had turned away from Mitchell and that they should switch their vote as well. I was serving as an informal coordinating mechanism. And in this case, I was right. Cutler achieved an unprecedented 10 point increase between late October and November 2. I felt the need to help like-minded voters coordinate. We desperately need coordinating mechanisms in a state like Maine, where races frequently see more than two strong candidates. Without an election method like ranked choice voting which lets voters choose their true preference without a negative consequence, our current system punishes sincere voters who vote for the third-ranked candidate by effectively removing their votes from the top-two candidate they would otherwise support. In other words, voting your top choice may help get your last choice elected. Because of this unpleasant reality, voters mostly understand that they need to vote strategically. But how do you vote strategically if you don’t know which two candidates have the most support? Without that information, voters are unable to tell whether their true preference is in the top two, or if they should instead vote for the least-bad alternative. After Cutler’s unprecedented surge at the end of the 2010 race, we have an especially strong need for this information since we know that the answer isn’t always obvious. The question Maine’s Democrats and left-leaning voters need answered this week is: are we seeing a surge for Cutler similar to what we saw in 2010? Without ranked choice voting, we must come up with imperfect ways to compare the candidates’ likely support before election day. 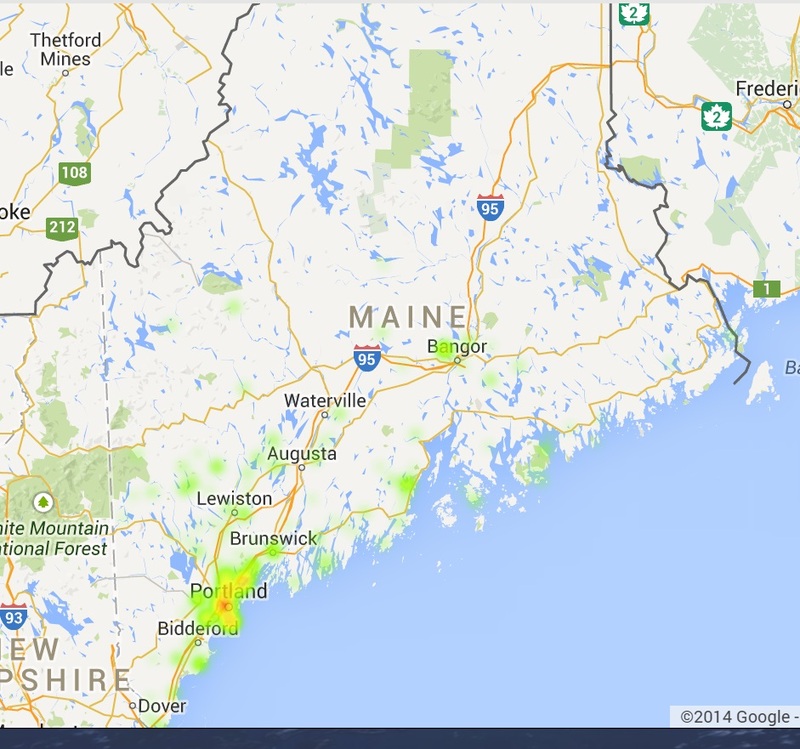 This is why polling Maine’s gubernatorial race is so vitally important. Since I am not in Waterville this week to conduct this personal civic duty, I tried to come up with an alternative mechanism. We can take a look at how people are voting with their wallets. The huge increase in the amount and significance of campaign donations in Maine’s elections since 2010 is generally very depressing, but in this case it might come in handy as an indication of how much committed support the candidates have across the state. While the profile of Maine campaign donors is not a great match for Maine voters more generally, it’s a reasonable way to think about the range and depth of commitment across at least a meaningful and politically active segment of Maine’s electorate. In particular, it is useful as a gauge when we look not at how much money the candidates are raising, but how many Mainers are contributing. For this kind of use of campaign data it doesn’t really matter how much an individual can give, because it’s just a proxy for committed candidate preference. People might be able to give more or fewer dollars, but they can only vote once. 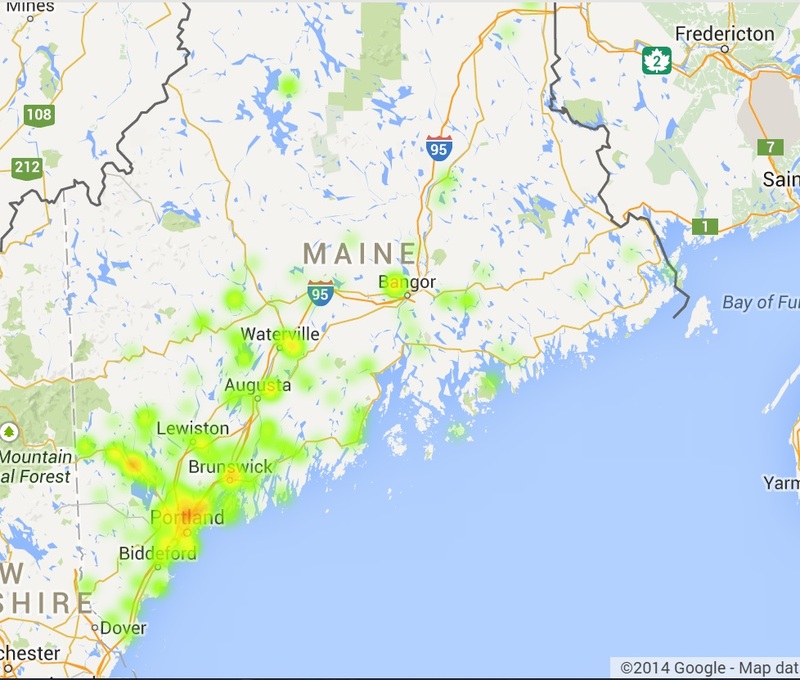 So how many Mainers gave more than $50 in the last few months to the gubernatorial candidates? 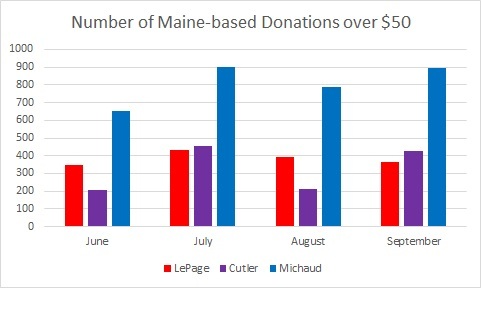 The numbers vary substantially, but for the last four months Michaud has generally received twice the number of donations made by the other two candidates. This is not immediately obvious from looking at campaign donation totals. 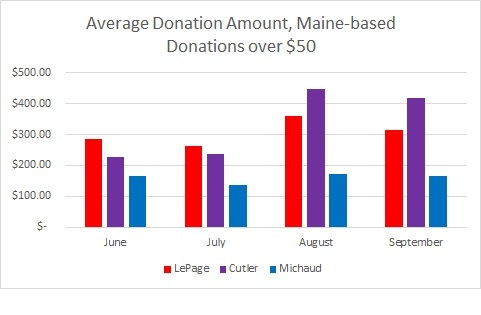 The average Michaud donation is substantially smaller than the average Cutler donation or average LePage donation. This may lead to campaign contribution amount totals being a misleading measure of local support, since it suggests a lower number of contributors. New donations will be filed with the Ethics Commission on 10/24, and I’m looking forward to taking one last look later this week at how support changed during October. 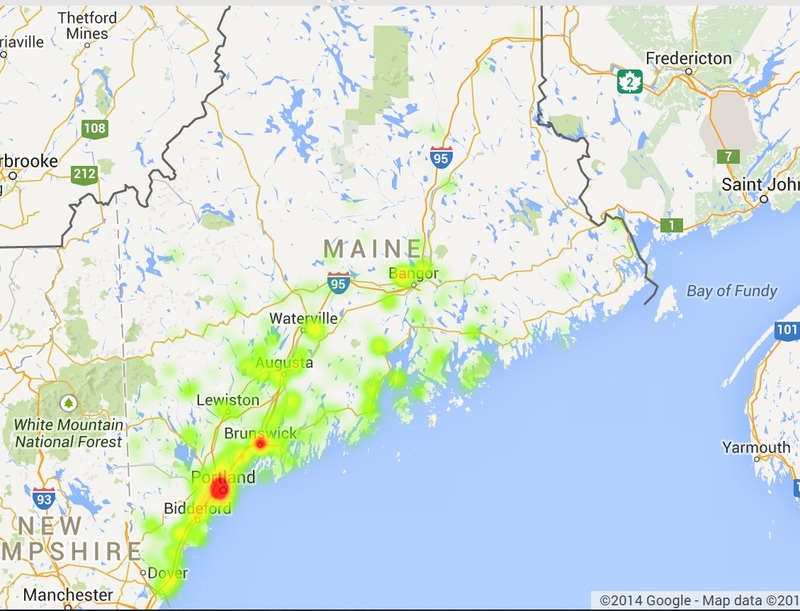 So what do campaign contributions tell us about how the wind’s blowing in Maine this year? They tell us that Michaud has witnessed the highest number of Maine donors in the last four months. They tell us that both Michaud and LePage have a stronger base of support across the state than Cutler, and that Michaud has the highest density of southern Maine support across the three candidates. This is a telling difference from 2010, when Cumberland and Sagadahoc Counties provided Cutler with a critical base of support. All up the coast, in fact, where Mitchell did more poorly than average in 2010, Michaud appears to have support. So what’s causing this difference? 2010 and 2014 began in very different ways. The 2010 gubernatorial primaries on both sides were fiercely contested, with astonishing levels of rancor and spending. The fact that three independent candidates joined the partisan candidates in vigorous campaigns throughout the race revealed the breadth of disagreement over the state’s political future. This time, meanwhile, the field settled quickly, with two partisan candidates who already enjoyed strong statewide support. The Republican party quickly confirmed Governor Paul LePage as the 2014 nominee, despite some early chatter about primaries. (Even with the governor’s challenges, as national odds are strongly in his favor: since 1980, almost 80% of incumbent governors win re-election.) Maine Democrats, meanwhile, made up for their party’s divisive 2010 primary by selecting Congressman Mike Michaud, a nominee whose six successive elections to represent Maine’s second Congressional district demonstrated his electoral strength in the part of the state traditionally less friendly to Democrats. Because of the strength and broad name-recognition of this slate of candidates, recent polls are showing that only between 3 and 5% of voters are currently undecided, and that suggests — contrary to 2010 — that if a large shift happens at the end of the race it will require a large number of people to vote away from their current preference. It’s not a poll, but I don’t see a large shift in the direction of candidate support happening this year.